Copyright © Jeff Scovil - This image is copyrighted. Unauthorized reproduction prohibited. 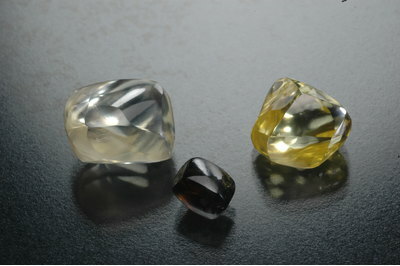 The Star of Shreveport (colorless, 8.82 cts), Sunshine Diamond (canary, 5.47 cts) and the Black Beauty Diamond (1.45 cts). The Star of Shreveport is the second largest diamond found since 1972, while 'Sunshine' is one of the most celebrated canary yellow stones found in recent years. Finally, the Black Beauty was found by legendary miner James Archer in 1999 and was one of his most favorite finds. Houran Collection.